Georgetown Herald (Georgetown, ON), 1970, p. 3 Hornby Presbyterian Church. The first church was built in 1835. 20 January 1878, Mr. Stewart, Minister. Burnt down Wed 14 January, 1976. The chain link fence suggests the age of the picture. 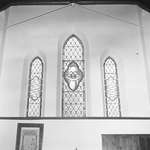 Georgetown Herald (Georgetown, ON), 9 Jul 1970, p. 1 St. Paul’s Baptist Church, 100 Mountainview Road, South (Immanuel Lutheran Church -2017).